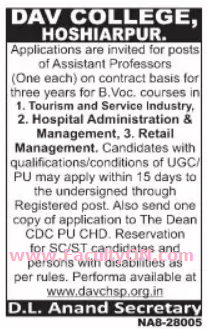 DAV College, Hoshiarpur has advertised in the TRIBUNE newspaper for the recruitment of Assistant Professor jobs vacancies. Interested and eligible job aspirants are requested to apply within 15 days from 01st August 2018. Check out further more details below. College Profile: Accredited with Grade ‘A’ by NAAC in January 2014, DAV College has, over the decades, carved a niche for itself in the fields of Academics, Sports and Extra-Curricular activities. Established in 1926, a grant-in-aid institution, it is affiliated to Panjab University Chandigarh. Situated on Hoshiarpur Chandigarh road, the college was established by the trust, whose aim was to promote and spread education in the rural heartland of Punjab in pre-partition days. The institution was recognized by the University Grants Commission under Section 2(f) in April 1956. Qualifications: As per UGC / PU norms. Salary: As per College norms. How to Apply: Interested and eligible candidates are requested to send application along with CV, attested copies of certificates and 02 recent PP size photos to the following postal address.